Peter and Gordon were a pop duo whose most well-known song arguably is the Paul McCartney written “A World Without Love.” (Which, according to Asher, nobody wanted.) While they went on to have some other hits, including the odd but catchy “Lady Godiva,” perhaps the longest-term impact is that Peter Asher went on to become the Artists and Repertoire manager of Apple Records. He also produced both James Taylor (Apple’s first artist) and Linda Ronstadt. And of course, his sister Jane was McCartney’s girlfriend at the time. (Peter is still with us, Gordon died a few years ago. They managed to have a brief reunion about 10 years ago). For the record, Peter is the red-headed guy who bears some resemblance to Austin Powers. In fact, Mike Myers is said to have based Powers’ appearance on poor old Peter. Liverpool’s a big city (over 2,000,000 people in the greater metro area) and the Beatles really lived nowhere near the downtown area where the clubs, including the Jacaranda were. (The Jacaranda, the first club the Beatles played, was still open. We wanted to hang out and see a band but our tour guide advised us that maybe downtown Liverpool wasn’t the best place to be at night. This was in the late ’80’s so maybe things have gotten better there, don’t know). Gerry and the Pacemakers were all chums with the Beatles. At one point we stood beside the 70-mile-long River Mersey which runs throughout the city. And so of course I had to sing this beautiful song to a city that Gerry Marsden obviously loved. (It is 100% mandatory to sing this song if you’re standing by the Mersey. This was much to my wife’s chagrin as my singing voice is akin to a cat with its paw stuck in a blender). The Spencer Davis Group had a couple of hits such as “Gimme Some Lovin'” and “I’m a Man,” the latter given a fantastic cover by Chicago (which you can listen to at my Rock n Roll Hall of Fame rant here.) Both songs were notable in that they introduced the world to the voice, songwriting and keyboard playing of an 18-year-old Steve Winwood. The most common comparison of his singing was to a young Ray Charles. Winwood went on not only to co-found the seminal bands Traffic and Blind Faith (with old chum Eric Clapton) but still enjoys a great solo career. “Lovin'” is a terrific song. If I was in a band, this is one of the first songs I’d learn. Winwood on vocal and organ. So if you weren’t around back then, I just wanted to establish that the “British Invasion” was made up of quite a bit more than the Beatles and Stones. And I haven’t even mentioned Donovan, the Kinks, Procol Harum, etc. But trust me. Their posts are coming up, later down the road. Next post will be tomorrow to mark a very important anniversary. 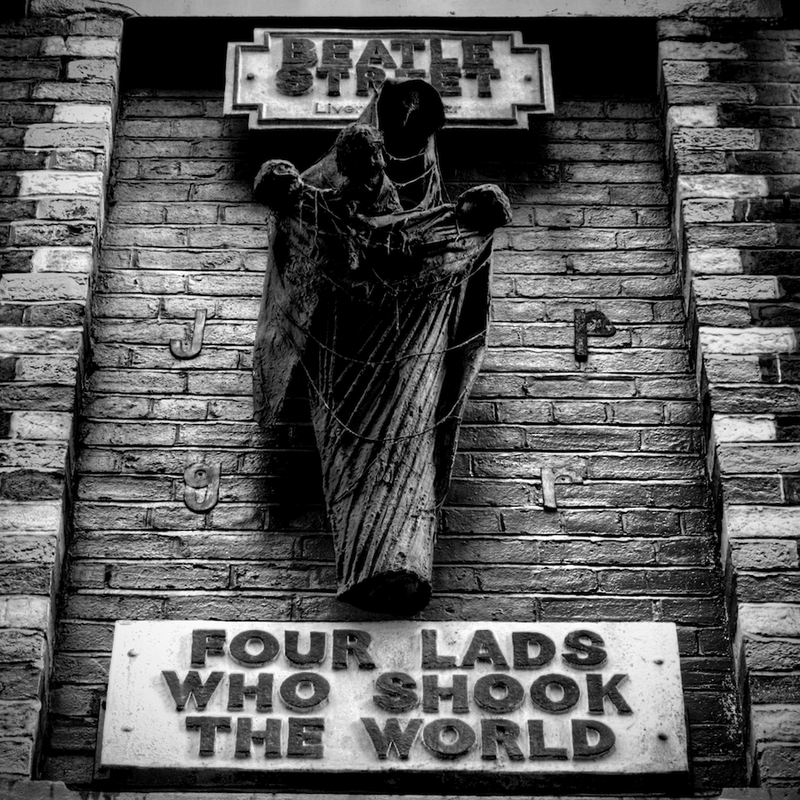 And then, we have to deal with the “Four Lads Who Shook The World.” That strange-looking plaque you see hangs on Matthew Street in Liverpool, site of the original Cavern Club.